If I open a new World, for ex. 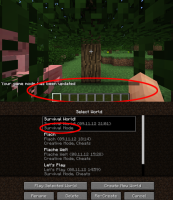 in Survival, and change the gamemode ingame to Creative, and leave then the game, then in the world selection there is the default gamemode. MC-9671 /gamemode not updating on a server for new players loging on. MC-21093 Always i enter in my creative world, the world is in the Survival mode!